Not up to date. 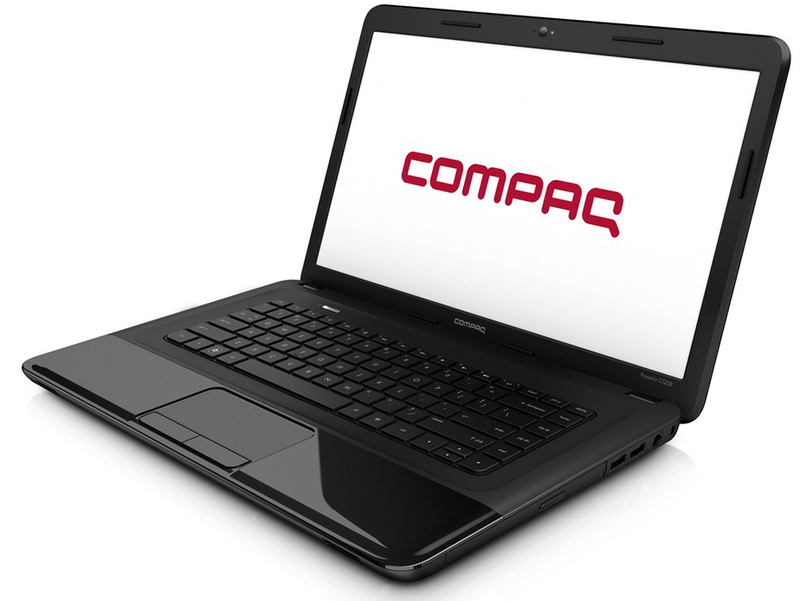 With the Compaq Presario CQ58-350sg Hewlett Packard offers a cost-effective notebook containing an AMD E1-1200 APU. 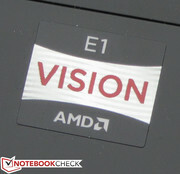 The AMD APU is not one of the most powerful representatives of its kind, but scores with low energy consumption. Theoretically, HP should have an enduring office laptop in its repertoire. Our test will show if this assumption holds up. 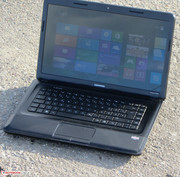 Compaq Presario is HP's cost-effective notebook segment. We have already tested numerous examples from this series. With the CQ58-350sg (price: 340 to 400 Euros, ~$443 to $521), we hold another representative in our hands. In 2012 we tested the CQ58-148sg (Pentium B950, HD Graphics; currently about 440 Euros, ~$573), which is based on Intel technology. We will find out in our test if the CQ58-350sg is recommendable. 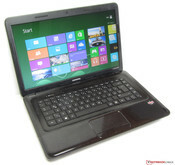 To classify the notebook, we compare it with its competitors Samsung Series 3 355E5C-S02DE (AMD E2-1800, Radeon HD 7470M) and Acer Aspire E1-531 (Pentium B960, HD Graphics). The CQ58-350sg uses the same case as the CQ58-148sg. For this case HP uses black plastic. 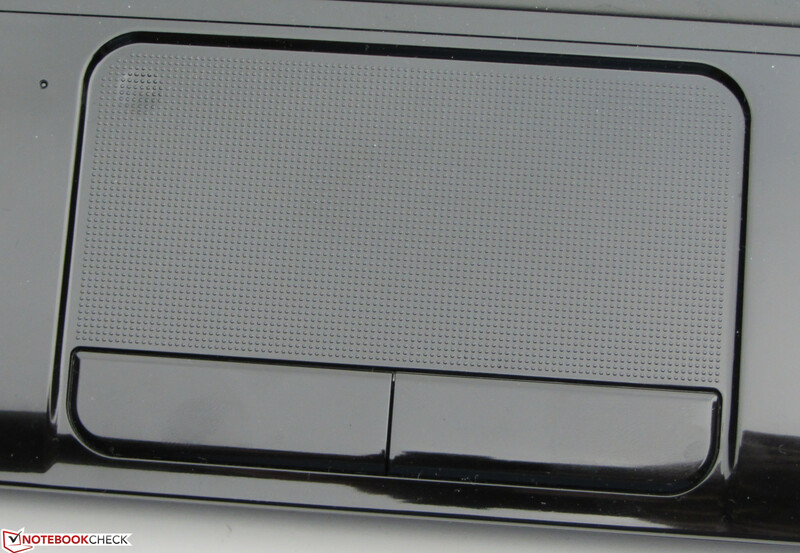 The backside of the screen as well as the palm rest have a shiny surface. The rest of the surface is in matte black. The shiny surface is especially susceptible to fingerprints. The cases of the Samsung and Aspire computers are also completely made of plastic. The base-unit only gives in slightly under pressure. However, around the touchpad it can be bent. For a laptop of this price segment, the torsional rigidity is also more than acceptable. While the base-unit is solid, it is a different matter with the lid. It can be noticeably twisted. Especially in the middle it can be pushed in to a point where image alterations can be observed. The hinges keep the lid tightly in its position. It is not possible to open the lid with only one hand. The shiny surface attracts fingerprints. It has two maintenance covers. All of the three computers which we compare the Hewlett Packard with come with the usual equipment. However, the CQ58-350sg is a little bit behind its competitors. 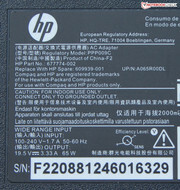 The HP computer is the only one that offers a 10/100 Mbits/s Ethernet port. The competition offers Gigabit-Ethernet. Additionally, the Samsung notebook is the only one that contains USB 3.0 ports. Thus the CQ58-350sg is a little bit outdated. Some of the ports of the HP computer are poorly positioned and set in the front area of the left side. The WLAN-module of the HP laptop is from Ralink and supports the WLAN-standards 802.11 b/g/n. The WLAN reception varies tremendously. Even within a close distance (about 3 meters) of the router, the Windows WLAN display swings between two and five bars – depending on how the notebook is positioned. 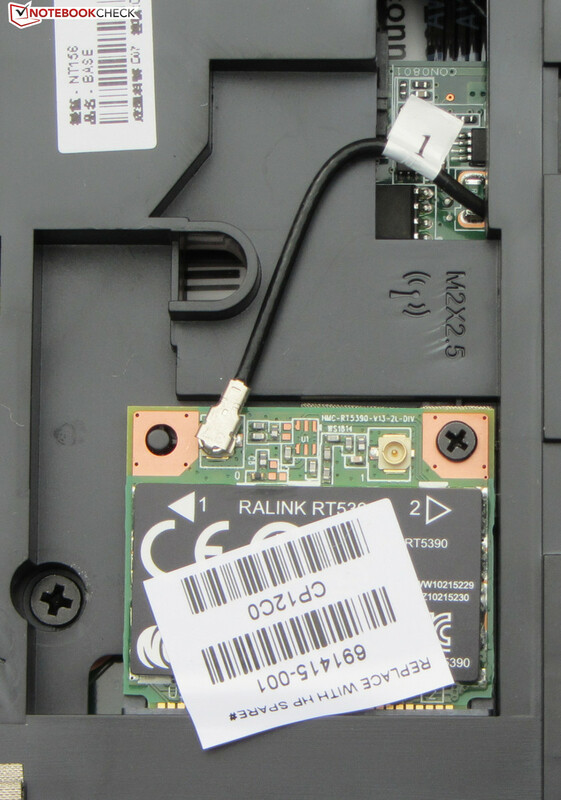 The reason is found inside the laptop: HP uses only one WLAN antenna for its cost-effective notebooks – and this is also the same for the CQ58-350sg. At least two antennas should be used as standard. HP also fails to shine in the area of cable-supported networks, because only one Fast-Ethernet chip was fitted into the CQ58-350sg. A Gigabit-Ethernet chip ought to be included by today's standards. The webcam delivers slightly washed-out pictures up to a resolution of 320x240 pixels. 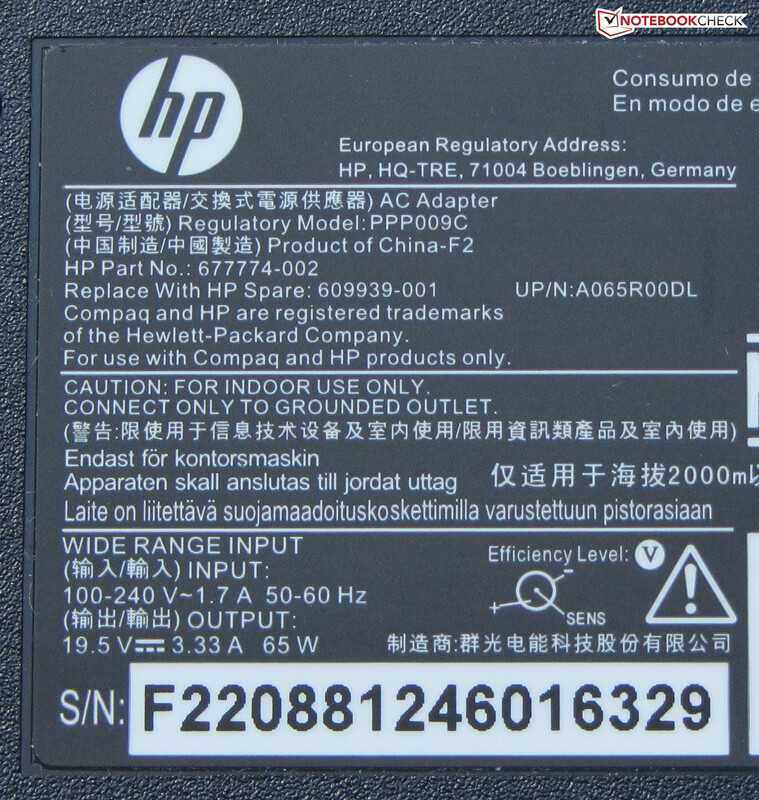 Accessories are limited: Beside a quick-start poster, you will find a list of worldwide telephone numbers for HP support and a short manual for Windows 8. 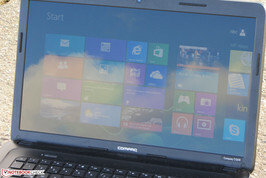 HP delivers the CQ58-350sg with a preinstalled version of Windows 8 (64 Bit). A Windows DVD is not included. 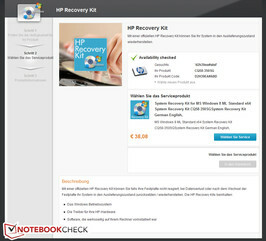 You can make a set of recovery DVDs with the HP Recovery Manager. Alternatively, HP offers the possibility to buy the corresponding DVD. The recovery DVD contains the operating system and also all drivers and preinstalled software. The price is currently about 38 Euros (~$49). The recovery medium can be ordered here. You need the product number of the notebook to order (which is stated on the packaging). 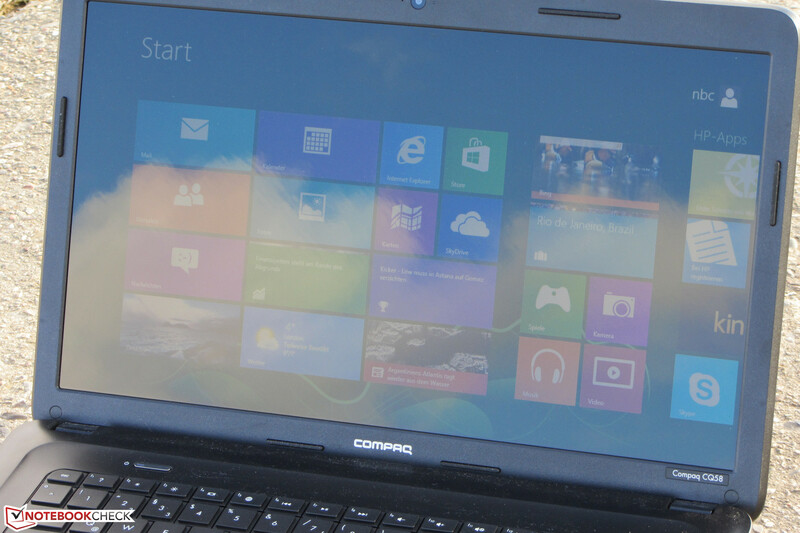 In case of a defect, the operating system can be repaired with the help of the Windows 8 recovery system. 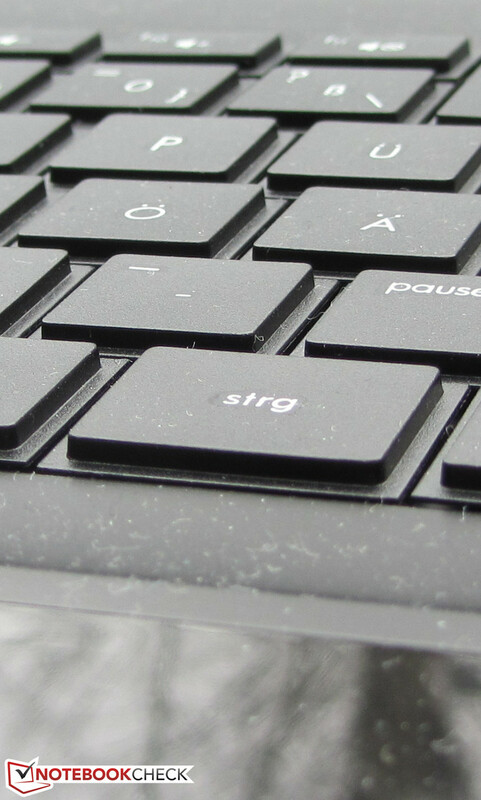 To start it, you need to press the F11 key right after turning the notebook on. Besides repairing it, you can also set it back to factory settings or reinstall completely. There is no support from HP if the preinstalled Windows 8 is replaced with Windows 7. HP only offers drivers for Windows 8. Many of the Windows 8 drivers should also operate under Windows 7. Only trial-and-error can show which drivers will work and which won't. Do not forget: Before deleting Windows 8, make a set of recovery DVDs. The memory, hard drive, WLAN-module and BIOS battery are behind two maintenance covers. There is no access to the fans. The CQ59-350sg is equipped with two memory slots. One slot is occupied by a 4 GB module. 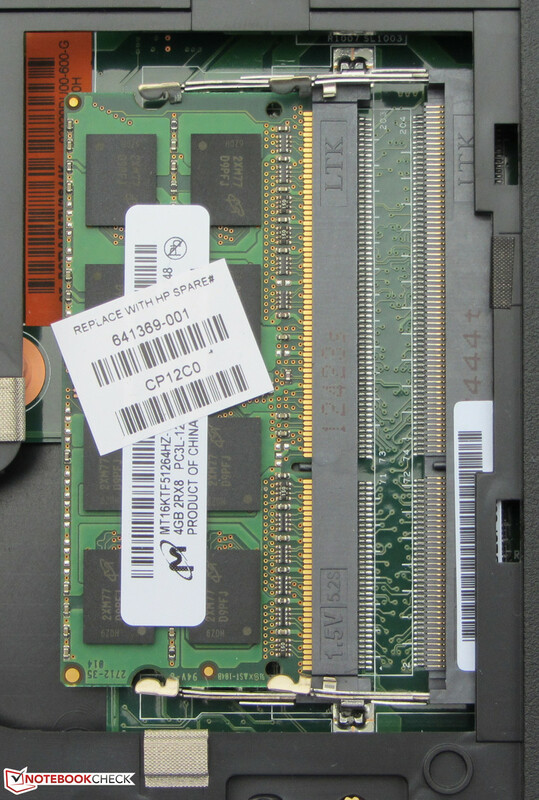 The memory can be extended up to 8 GB (manufacturer's information). Even with a second module, the memory does not operate in dual-channel mode, because the memory controller does not support it in this mode. It's easy to replace the hard drive. Only the fixing screws need to be loosened and the hard drive can be taken out. We had a 7mm hard drive in our test device. 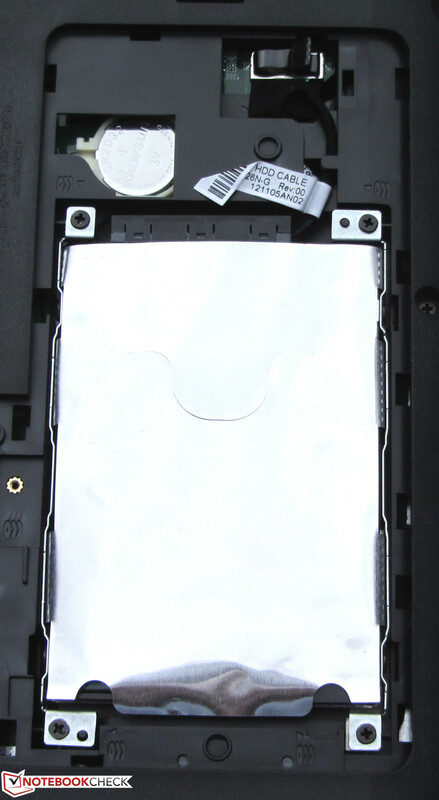 However, you can also use the common 9.5 mm hard drives. The frame of the hard drive can be attached to both types. Buyers of the CQ58-350sg have to be content with a 12 month bring-in guarantee. 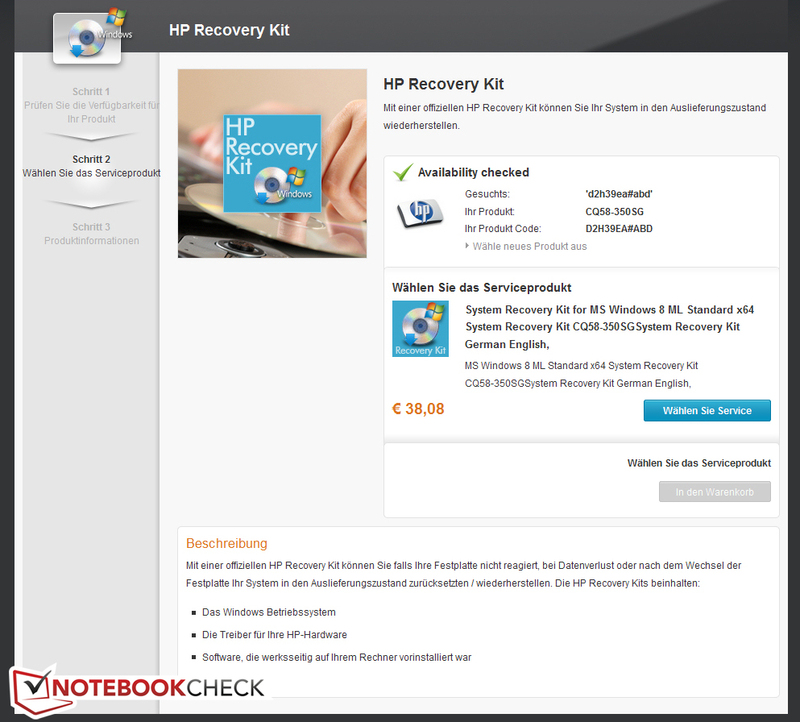 If a repair is required the owner sends the notebook to HP. Buyers of the Samsung or the Aspire laptop are better off. Both devices are equipped with a 24 month guarantee. 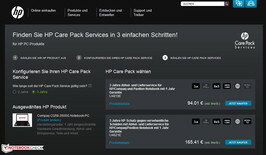 The guarantee of the HP computer can be extended up to two or three years – including pick-up service. Extensions cost 60 to 100 Euros respectively (~$78 to $130). On HP's website all guarantee extensions are listed and can be bought in conjunction with the product number. 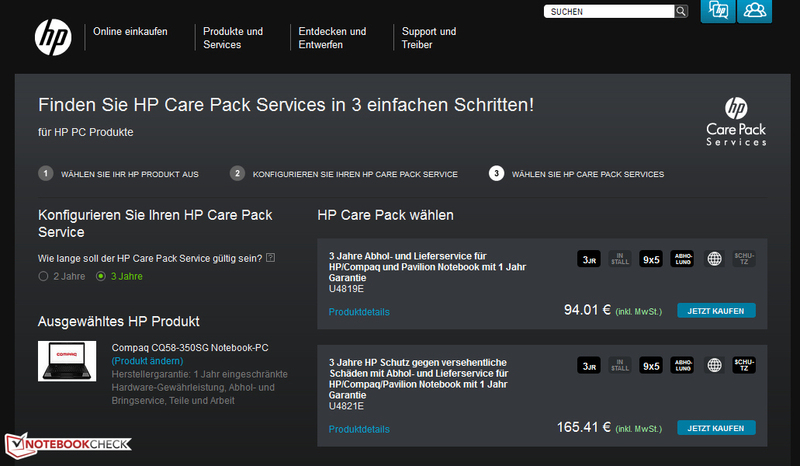 HP offers several carepacks for the CQ58-350sg. A recovery DVD can be purchased. 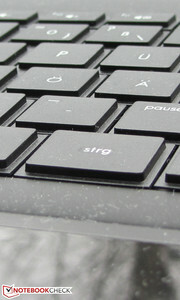 For the CQ58-350sg HP does not fit a chiclet keyboard, but a conventional keyboard. The flat, smooth keys have a clear pressure point and a normal stroke. The key resistance could have been a little bit firmer though. While typing, the keyboard generally does not recoil. Only at the upper edge can slight recoiling be detected. The LED indicators which are integrated into the WLAN and Caps Lock key come in handy. The 9.8 x 4.8 cm wide multi-touch touchpad is equipped with a dotted surface. It does not hinder the fingers while gliding. Each of the multi-touch gestures can be turned on and off individually in the configuration menu. 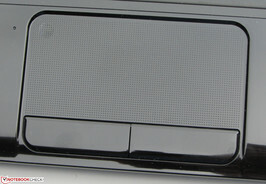 The touchpad itself can be activated or deactivated by tipping with one finger in the recess of the upper left corner. 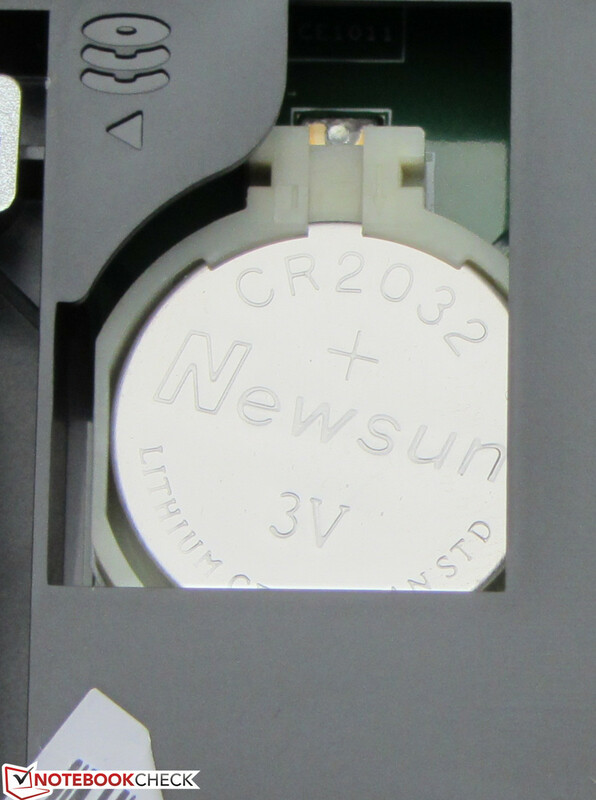 Left to the recess is an LED indicator, which informs about the activity state of the pad. Both mouse keys are equipped with a clear, audible and noticeable pressure point and short stroke. There is no keyboard backlight. The glossy 15.6-inch display operates with a native resolution of 1366x768 pixels. Other displays are not offered for the CQ58. At 210.9 cd/m², the average brightness of the display is in the midfield area. The display of the Aspire is, with 211.3 cd/m², on a similar level. The screen of the Samsung (226 cd/m²) is only slightly brighter. Contrast (252:1) and black value (0.83 cd/m²) lie in the common area for this price level. The Samsung can score here (400:1, 0.59 cd/m²), but the best results are from the Aspire (709:1, 0.313 cd/m²). Even displays of far more expensive models often cannot reach those values. 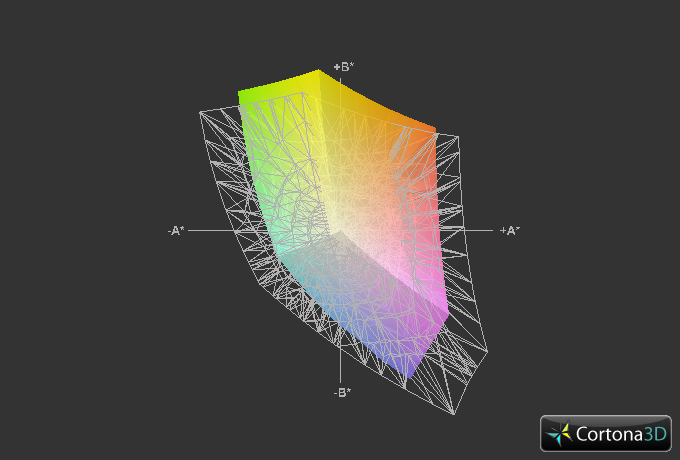 The color space of AdobeRGB and sRGB cannot be covered by the CQ58-350sg. We have measured the screen (target color space sRGB) in its factory settings and have found very high DeltaE-2000 deviations for white, cyan and gray. The rest of the colors do better with DeltaE values between 5 and 10. The screen has an obvious blue cast. The screen is not suitable for outdoor use. The display’s brightness and contrast are not high enough for it. Additionally, reflections make it more difficult to read. As expected, changing the vertical screen viewing angle causes image alterations. The horizontal direction performs better. Even from the side (nearly 180 degrees) the screen content can be recognized. However, it darkens significantly. The AMD APU used in the CQ58-350sg is not designed for high performance, but for low energy consumption. However, the processor can handle daily tasks like internet communication, editing, internet browsing and playing videos. Even Full HD videos (1920x1,080 pixels, H.264-coding) can be watched. The integrated decoder (UVD3) carries out the main part of playback. We have tested playback with the DXVA Checker tool and established a CPU usage of 10%. The CQ58-350sg is currently available for about 340 to 400 Euros (~$443 to $521). HP sells countless more models inside the CQ58-series – with Intel as well as AMD technology. Inside the CQ58-350sg is an AMD E1-1200 APU. The CPU part of the APU consists of a dual-core processor which runs at a speed of 1.4 GHz. There is no turbo available. The results of the Cinebench benchmarks hold no surprises: The CPU runs through all tests at 1.4 GHz, which causes the results to fall into the expected area. 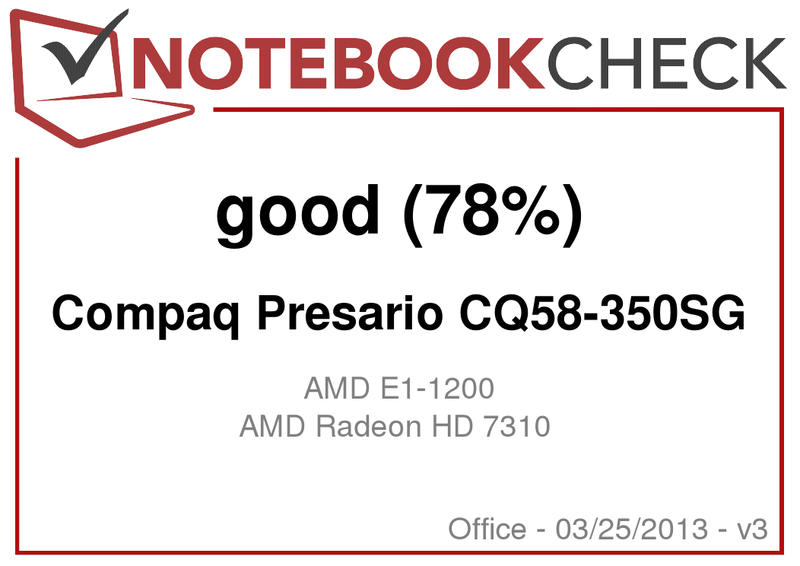 The CQ58-350sg scores lower in the CPU tests than the Samsung laptop (AMD E2-1800, Radeon HD 7470M) and the Aspire (Pentium B960, HD Graphics). This is due to the fact that the HP notebook is fitted with the weakest CPU. In the GL tests, the HP notebook again cannot keep up with its competitors. The only time it can keep up with the Aspire is in the GL test of Cinebench R11.5. Owing to its dedicated GPU the 355E5C always leaves both competitors far behind. Basically, the system runs smoothly. It only starts to struggle when the built in APU is overtaxed. This happens, for example, when too many browser windows are simultaneously open. You always have to keep in mind that the advantage of the AMD APU is low energy consumption and it is not classed as a powerful processor. 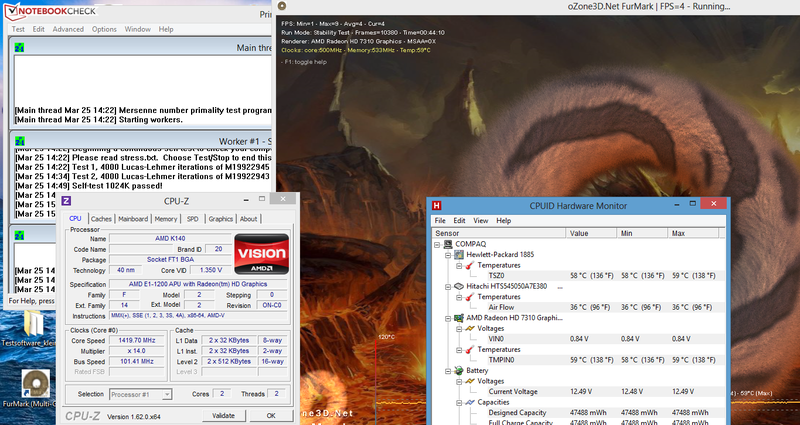 The result of the PC Mark 7 Benchmark lies where we expected to find to after numerous tests of this specific APU. 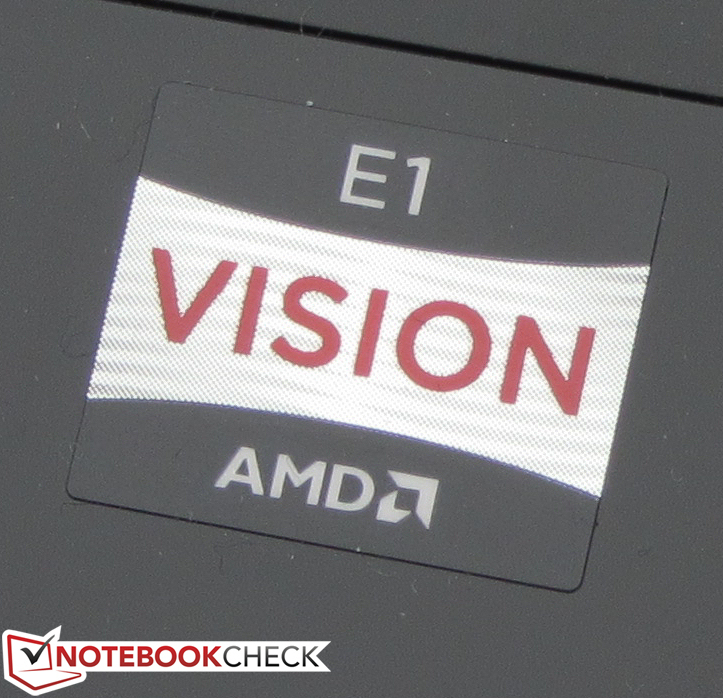 Once again, it is no surprise to find the 355E5C (AMD E2-1800, Radeon HD 7470M) and the Aspire (Pentium B960, HD Graphics) ahead of the HP computer. Both laptops are equipped with more potent hardware. HP uses a hard drive from Hitachi's Travelstar Z5K500 series for the CQ58-350sg. The drive has a capacity of 500 GB and spins at 5,400 rpm. CrystalDiskMark reports a reading speed of 101.2 MB/s. HDTune delivers an average transfer rate of 77.9 MB/s. Basically, those are very acceptable values for a 5,400 rpm hard drive. However, the 4k transfer rate could be better. This is important since a lot of data is stored in blocks of 4kb size. The access time also leaves something to be desired. The Radeon HD 7310, which is integrated into the E1-1200 APU, serves as the GPU. This entry-level GPU supports DirectX 11 and runs at a speed of 500 MHz. In the 3DMark benchmarks, the results of the CQ58-350sg did not come close to the results of the 355E5C (AMD E2-1800, Radeon HD 7470M) and the Aspire (Pentium B960, HD Graphics). Since the HP computer is equipped with the least powerful CPU, this does not come as a surprise. Those looking for a gaming notebook should avoid the CQ58-350sg. The integrated AMD APU is not suitable for playing current 3D games. The games do not even run smoothly with a low resolution and on low quality settings. Even a game like FIFA 13, which has very low hardware demands, cannot be played. Unfortunately, fitting a second memory module would not increase the frame rate, because the memory control of the notebook only supports single-channel mode. Those looking for a low-priced and gaming-grade 15.6-inch notebook should have a closer look at the Acer Aspire E1-571G (Core i3-3110M, GeForce GT 620M) or the HP Pavilion g6-2200sg (Pentium B980, Radeon HD 7670M). During idle, we notice a volume level of 32.4 dB. Though the CQ58-350sg is not loud, the value is slightly too high for such a low-performance and economical device. The 355E5C (31.2 to 34.8 dB) and the Aspire (32.1 to 33.3 dB) are at about the same level as the HP laptop. With 37.9 dB and 37.7 dB, the HP laptop shows no difference during medium load (3D Mark 06 running) and full load (Prime95 and Furmark running). In both cases the Samsung notebook (35.4 and 37.5 dB) runs a little bit more quietly. The Aspire generates more noise, at least during full load (37.2 to 40.4 dB). The case of the CQ58-350sg does not warm up noticeably at any time. During idle and full load the 30 °C line is rarely crossed. Thus the notebook can be placed on your thighs without any heat issues. The temperature of the palm rest also allows for comfortable working. Both competitors warm up more – especially during full load –than the HP laptop. Our stress test (Prime 95 and Furmark running for at least one hour) works both on the CPU and the GPU with full speed, during AC power operation as well as battery operation (CPU: 1.4 GHz; GPU: 500 MHz). The CPU temperature levels off at about 58 °C during main operation. (+) The maximum temperature on the upper side is 31.3 °C / 88 F, compared to the average of 33.9 °C / 93 F, ranging from 21.2 to 62.5 °C for the class Office. HP chose stereo speakers from Altec Lansing. 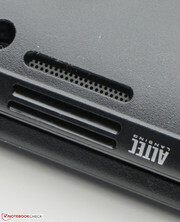 The speaker apertures are located at the bottom and front of the device. The sound of the speakers is quite satisfying. However the bass – like in most notebook speakers – is underdeveloped. Nonetheless, we would like to see speakers like this in many other notebooks. Most of the speakers we have listened to do not sound this good. Those who are not satisfied with the sound can always plug in external speakers or headphones. Since the HP computer only employs an economical AMD APU, the power consumption is rather low. During idle, we ascertain between 7.7 and 12.4 Watt. The power consumption of the Samsung notebook (9.7 to 15.3 Watt) turns out to be slightly higher, while the Aspire (6.9 to 12.8 Watt) roughly draws level with the CQ59-350sg. During medium load (3D Mark 2006 running) or full load (Prime95 and Furmark running), the HP notebook appears to be the most economical with 23.1 to 29.4 Watt. The Aspire (32.6 to 51.6 Watt) as well as the 355E5C (35.2 to 43.9 Watt) are less economical. During idle, the CQ58-350sg achieves a runtime of 8:33 h. The 355E5C (6:07 h) and the Aspire (6:10 h) lie far behind. 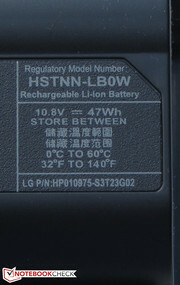 The runtime during idle is determined by the Battery Eater Reader's Test. The screen is running with minimum brightness, the energy saving profile is activated and all radio modules are turned off. Under full load, the battery does not quit until 2:15 h. This places the HP laptop behind the Samsung notebook (2:47 h) but far in front of the Aspire (1:13 h). We use the Battery Eater Classic Test to ascertain the runtime under full load. The screen is running with maximum brightness, high-performance profile and radio modules are activated. The more relevant WLAN test ends after 4:22 h. The 355E5C (3:51 h) and the Aspire (3:55 h) have to end their operations earlier. During the WLAN test, websites are automatically opened for 40-second intervals. 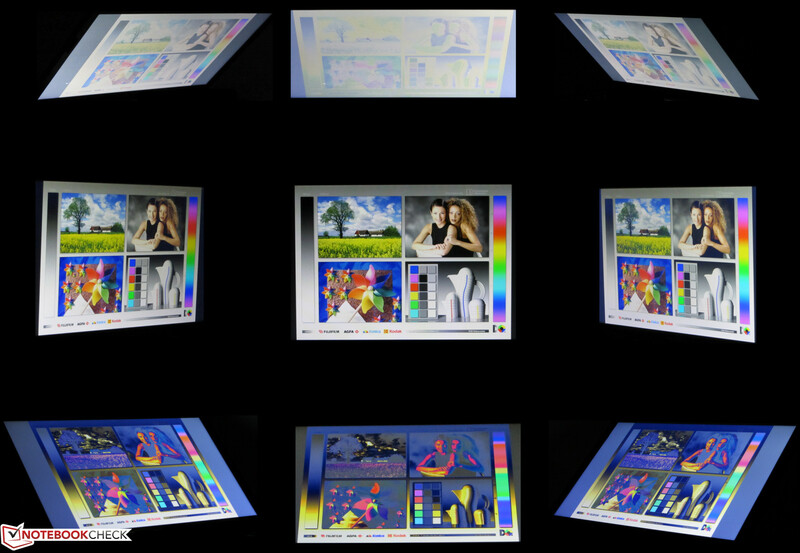 The energy saving profile is active and the display brightness is set to 150 cd/m². One charge of the battery provides DVD playback time of 3:51 h. Once again, the competitors (Samsung: 3:24 h, Acer: 3:10 h) fail to keep up. The DVD test is conducted with activated energy saving profile (or a higher profile, if the DVD does not run smoothly), full screen brightness and deactivated radio modules. The runtime of the three devices is easily comparable because of their similar battery capacities (Samsung, Acer: 48 Wh; HP: 47 Wh). The HP Compaq CQ58-350sg offers low energy consumption, low case temperature, moderate system noise and good battery runtimes. Despite those advantages, it is difficult to recommend buying this notebook. The low-contrast screen is not very convincing and neither is the twelve-month guarantee. Additionally, latest interfaces are missing from the device (USB 3.0, Gigabit-Ethernet). If low energy consumption is not the main purchase criterion then there are better notebooks in the price segment of 300 to 400 Euros (~$391 to $521). 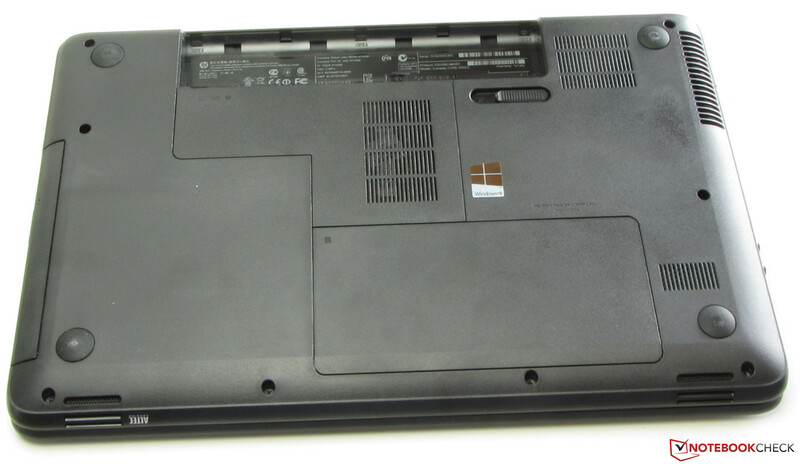 For example, the Dell Vostro 2520 offers better battery runtimes and much more computing power. 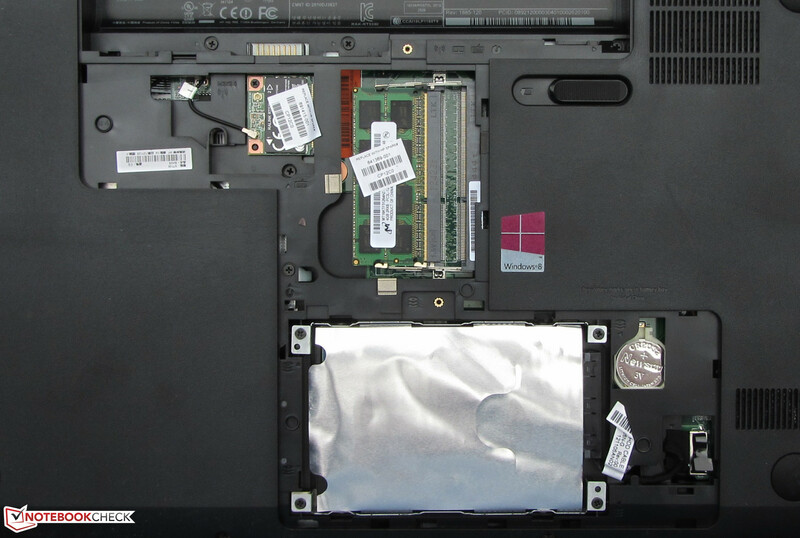 The Acer Aspire E1-531 is suitable for when a good display is needed. The Aspire's high-contrast screen is difficult to come by in this price segment. Anyone who prefers a matte screen should turn to the Samsung 355E5C-S02DE . The DVD burner reads and writes all kinds of DVD. The hinges keep the lid tightly in its place. ...and has a maximum power output of 65 Watt. ...and offers a capacity of 47 Wh. The WLAN reception varies, since HP only fitted it with one WLAN antenna. 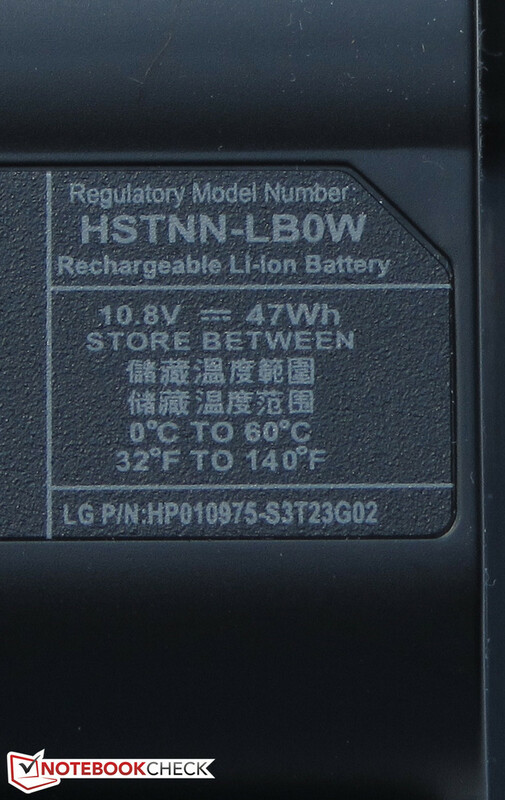 The BIOS battery is accessible. The hard drive can be changed easily. It has two memory slots. The speaker apertures are found at the bottom and front. The keys have a normal stroke. The low system noise and low case temperature. For the CQ58-148sg we'd like to see USB 3.0, Gigabit-Ethernet and a display with better contrast. 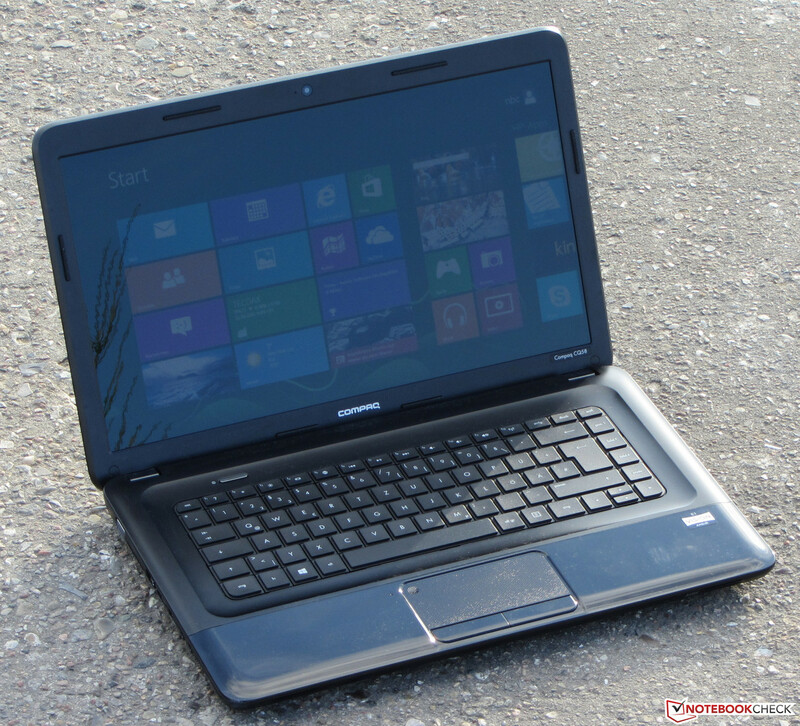 Hewlett Packard builds a low-cost notebook which is equipped with decent speakers. Samsung Series 3 355E5C-S02DE, Acer Aspire E1-531, Lenovo B575e, Asus F55A, Acer Aspire E1-571G, Fujitsu LifeBook A512, HP 650, Dell Vostro 2520, HP 655, Acer TravelMate P253-M, Lenovo IdeaPad N586.